Though I didnt like the looks of the putter and didnt like the feel of separating my hands to putt the ball, the results were nothing short of spectacular. Ball after ball rolled in the hole during my testing using the left top, right claw grip. I was impressed. The putter is not inexpensive at $189, but at least you get a lot of metal. The version I tested was 48″ however the 50″ is better for my height. The D.A.R.T. Acronym stands for directional and realignment technology. Seems a bit gimmicky for a long V-shaped line but anyway, results speak and I didnt seem to have any issues lining up putts with this putter. Long putters like this can help take the wrist hinge or handsy movements out of the putting stroke and thus deliver better results. We’ve confirmed with many stores that these putters are selling very well and up to around 30% of total overall new high-priced putter sales. 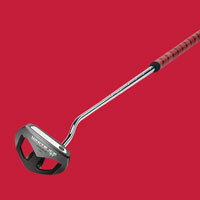 The tacky rubber grip is almost as ugly as the putter head; it’s red with a black spiral line running through it.